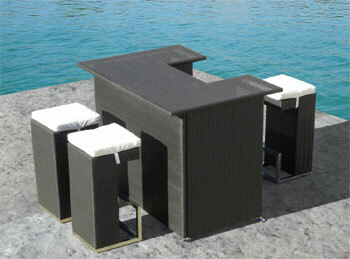 My favorite outdoor “bar” isn’t even a bar – it’s a dining set made by Belham Living. However, the reason I like it so much is that you can use it for either. On the other hand, if you are hosting a small dinner party, the set can be used first as an open bar and later as a dining table. No need for lots of space or furniture! Another cool thing about this wicker furniture is that its modern design makes it work well indoors or out. So don’t be shy about using it year-round if you want to throw a party indoors during the wintertime. 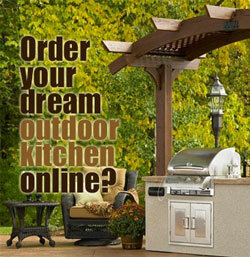 Yes, it is designed for the outdoors with aluminum framing, weather and fade-resistant wicker and olefin cushions. The ultra-durability simply means that these pieces will last a long, long time for many events to come. 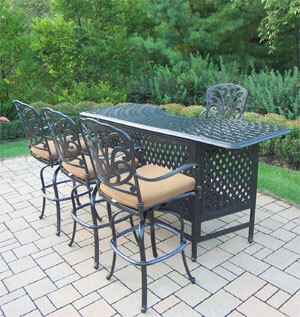 If you’re looking for something a little smaller that you can use in a corner or next to the wall of your house, this 3-piece outdoor bar with 2 stools is a good size. (It also has a lower price tag as well!) The design is simple yet sophisticated, and the bar has a shelf – which you don’t get with the table above. The Palm Harbor bar is sleek, durable and light enough to easily move around if necessary. In fact, you can even take it with you to use at a friend’s house or other location. Once again, no need to keep it outside year round if you want to use it indoors. Want something a little larger and more elegant? 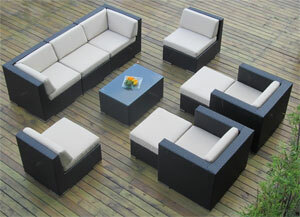 Check out the Hampton 5-piece set with twice as much surface area. It can be used to serve more drinks or as a dining table – or both! Made of heavy-duty rust-free aluminum and a powder coat for a classic finished look, the Hampton makes a statement all on its own. 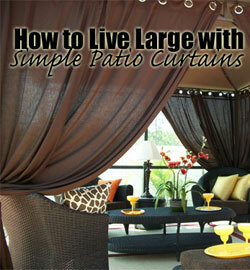 It upgrades the look of any backyard and may draw you out on the patio more often to enjoy a cocktail at happy hour. It looks more expensive (and it is), with its comfortable swivel chairs, unique tabletop and chair back designs and plush Sunbrella cushions. You get what you pay for. This set from Mango Home is very similar to the Palm Harbor bar above. However, it is designed to be large enough for both serving drinks and dining. You could even add 2 more stools along the sides of the bar for additional seating if you needed to (although this might be a tight fit). 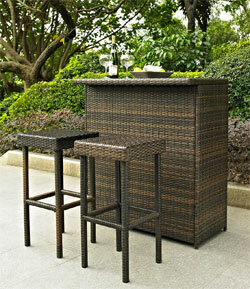 It’s got the same weather-proofed resin wicker and sturdy durable aluminum frame as the items above. It looks black, but it’s actually a dark espresso color. There are 6 color options when it comes to the cushions, which makes it easy to match to other decor or furniture in your yard.